Whenever we perform spine surgery, we hope that this will be the only spine surgery a patient needs. However, having spine surgery does not guarantee that spine problems are gone for good. In some cases, the initial procedure worked but new problems arise. In other cases, the original surgery failed. Regardless of cause, pain and other symptoms can continue. It is common to have some pain after surgery It is common for patients to have some pain after surgery and presurgical symptoms may take some time to improve or resolve. 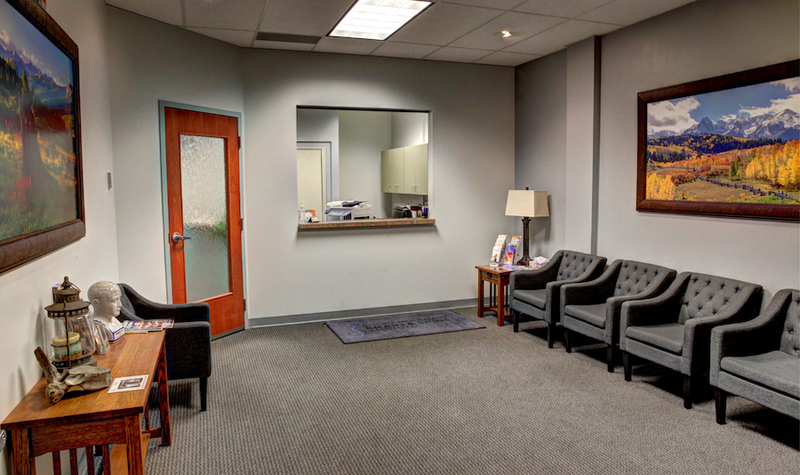 However, if pain is persistent or worsens, or other new symptoms develop, then an evaluation should be performed. The surgical treatment of a disc herniation can be to remove that herniation. 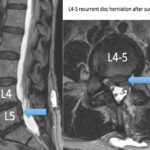 Usually this type of decompression is performed in the lumbar spine, although discectomies can also be performed in certain circumstances in the cervical spine. The procedure involves only removing the herniated part already extruded from the center of the disc. The majority of the disc is left alone. The hole in the disc from which the herniation escaped needs to scar over with time. After the procedure, another herniation may occur. This can occur up to 20% or more of the time. 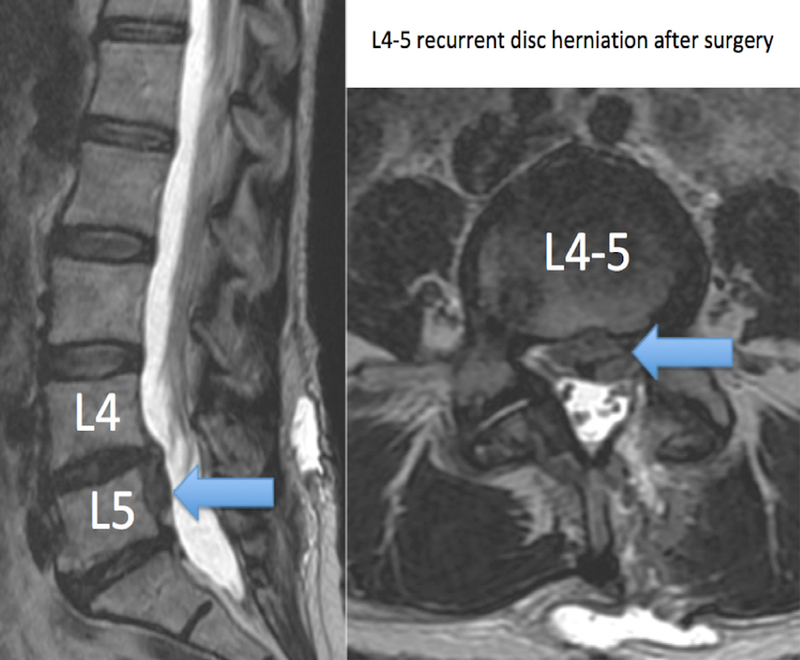 Even if a patient precisely follows the surgeon’s recommendations, a disc may re-herniate. 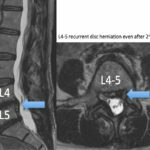 Options for treating re-herniation range from observation to conservative treatment to repeat decompression to fusion. The patient in this example underwent L4-5 decompression, but developed recurrent symptoms a few weeks later. Again, a few months after the repeat decompression, the symptoms recurred. This patient may benefit from fusion. 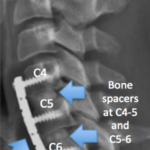 A fusion procedure, whether in the cervical or lumbar spine, really involves two parts. The first potion is the actual surgery. 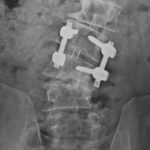 The nerves are decompressed, a bone spacer often replaces the disc, and metal screws with rods or plates hold the level(s) in place. This ideally initially improves the symptoms. However the second portion occurs over the next 6-12 months after the surgery in which the bones grow, or fuse, together. If this process does not complete, then pain and symptoms may return later. 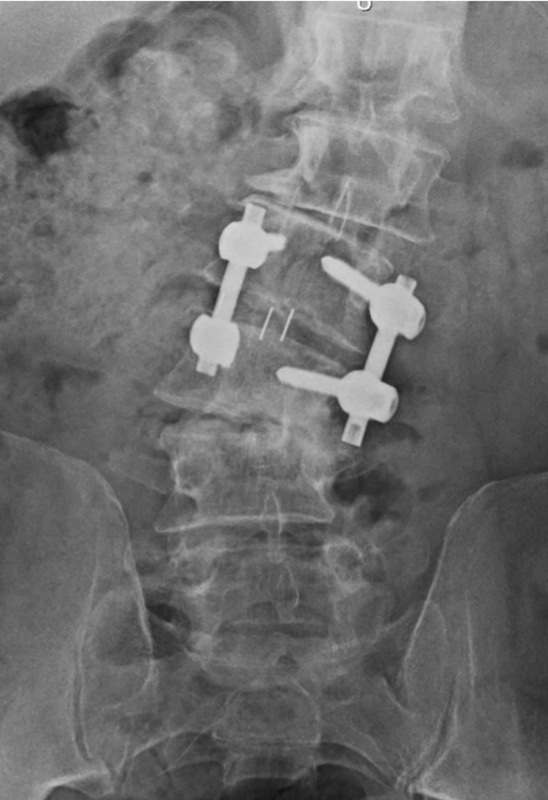 Not all failed fusion, or pseudoarthrosis, is symptomatic. Sometimes, patients have no symptoms and nothing needs to be done. However if symptoms occur, then reoperation may be needed. 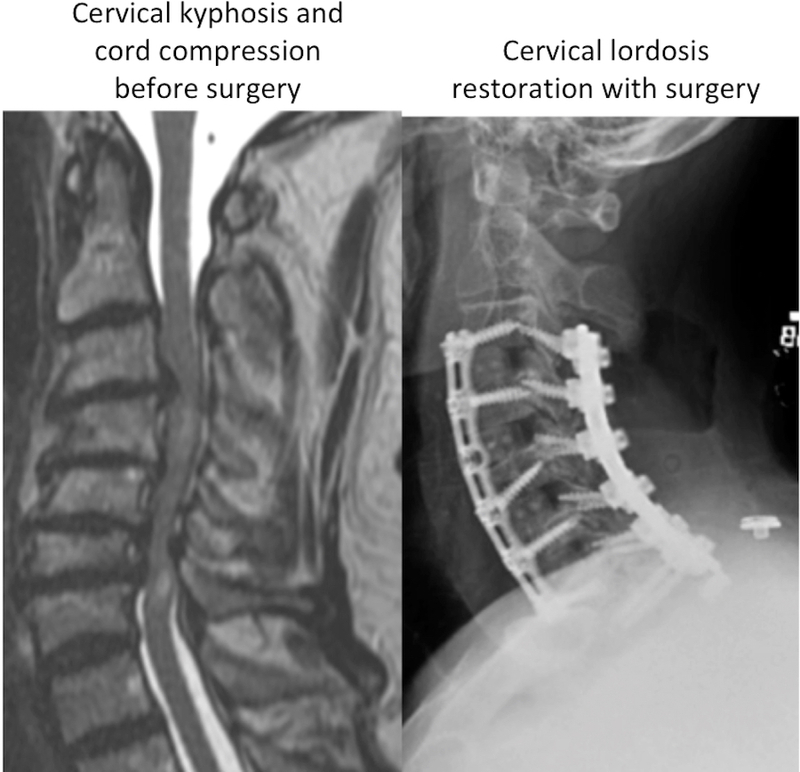 This is a patient underwent a cervical fusion by another surgeon. The symptoms improved initially, but later the patient developed neck pain. The x-ray does not seem to show any problems. 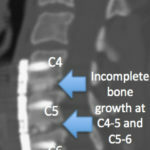 The CT scan more than a year after surgery shows that the bones did not fully grow together, indicating failed fusion or pseudoarthrosis. 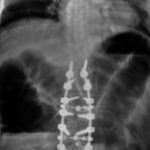 This patient may benefit from revision fusion. 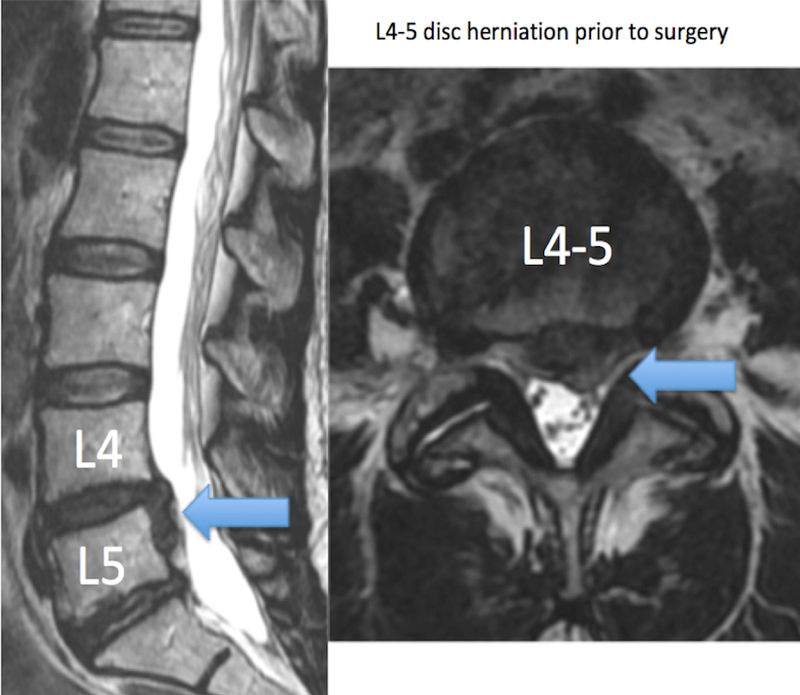 This is a patient with disc herniations and nerve compression at C4-5 and C5-6. 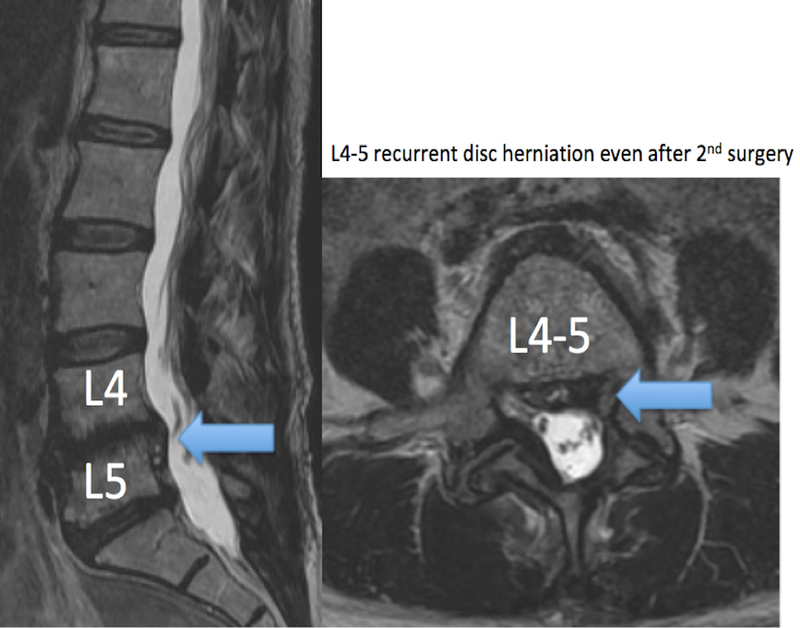 Following fusion, there is a reported ~2-3% per year risk of disc problem at a nearby level. There is debate whether the fusion adds stress to the adjacent levels and causes the adjacent levels to degenerate quicker. 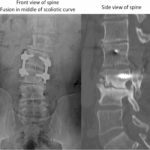 Artificial disc replacement may lower this risk. 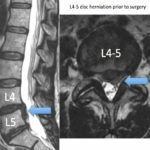 Regardless of cause, an adjacent level may develop a disc herniation or nerve compression and require repeat surgery. 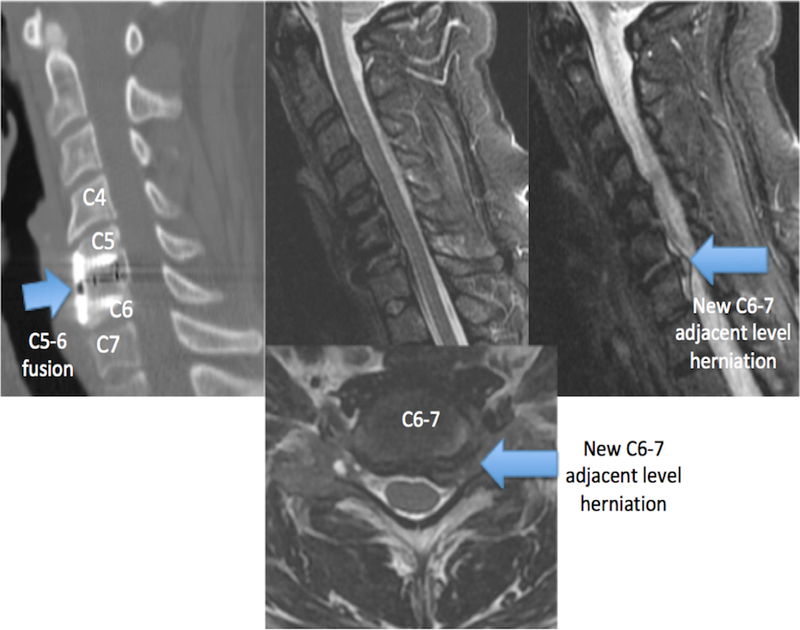 This patient may benefit from extension of the C5-6 fusion to the C6-7 level. 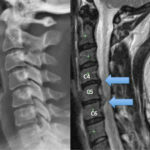 Many patients have degenerative changes in their spine, but not all of the degenerative changes seen on imaging are the cause of their current symptoms. 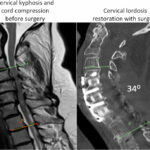 After trying conservative options, which often identifies the symptomatic spine levels, surgeons try to only operate on the symptomatic levels. This usually improves the initial presenting symptoms. Over time however, the other untreated spine levels may become symptomatic. This may require revision surgery. 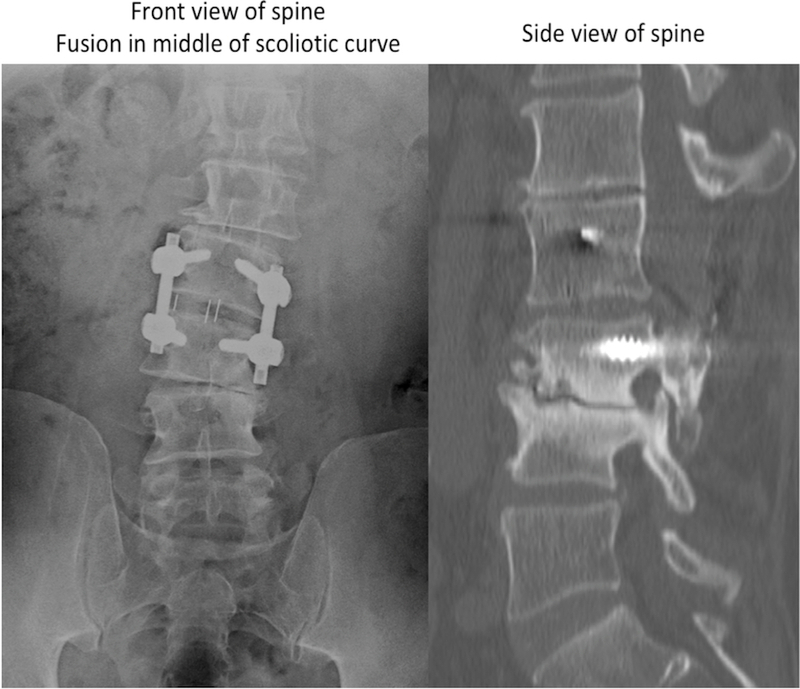 In the setting of scoliosis, a fusion in the middle of the curve that does not correct the curve may lead to problems later. It is not uncommon for scoliosis patients who undergo surgery without correction of the curve to require curve correction later. 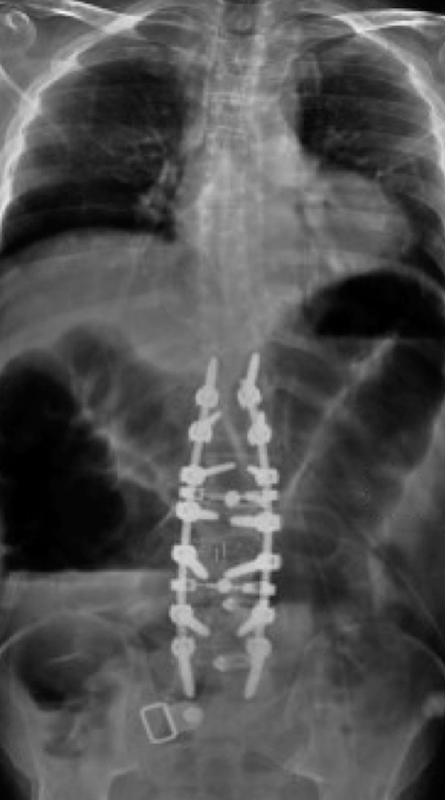 This patient underwent a fusion in the middle of their scoliotic curve. This initially resolved their pain, but eventually led to progression of the curve and recurrent symptoms. Extension of fusion to correct the curve resolves the symptoms long term. Thoracic disc herniations are infrequent because the ribs of the thoracic spine stabilize the levels. When thoracic disc herniation occur, they usually do not cause symptoms or require any intervention. 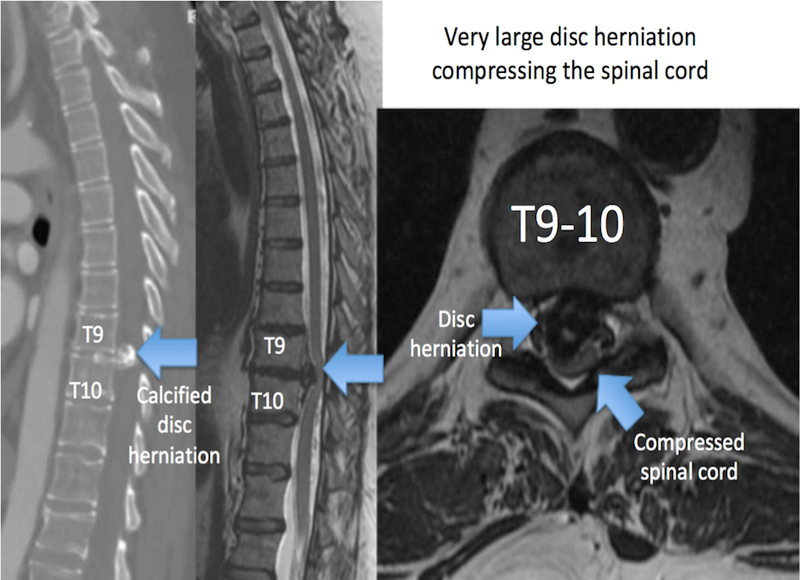 In rare circumstances, thoracic disc herniations can be large and compress the spinal cord. 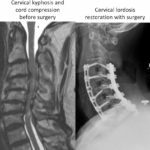 When this occurs, the surgery is very complex and requires approaching the spine from the front or side to avoid injuring the spinal cord. 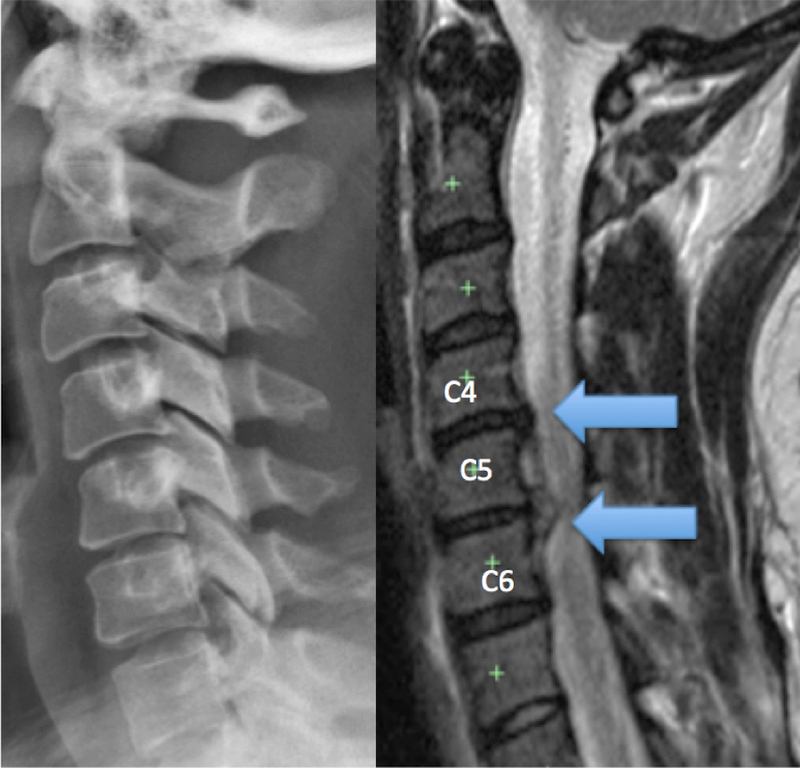 Especially in the cervical spine, extreme and severe compression of the spinal cord with loss of its natural curve (lordosis) may require decompression and fusion of both the front and back of the spine. Performing the procedure only from the front can restore the lordosis, but is unlikely to provide enough decompression. 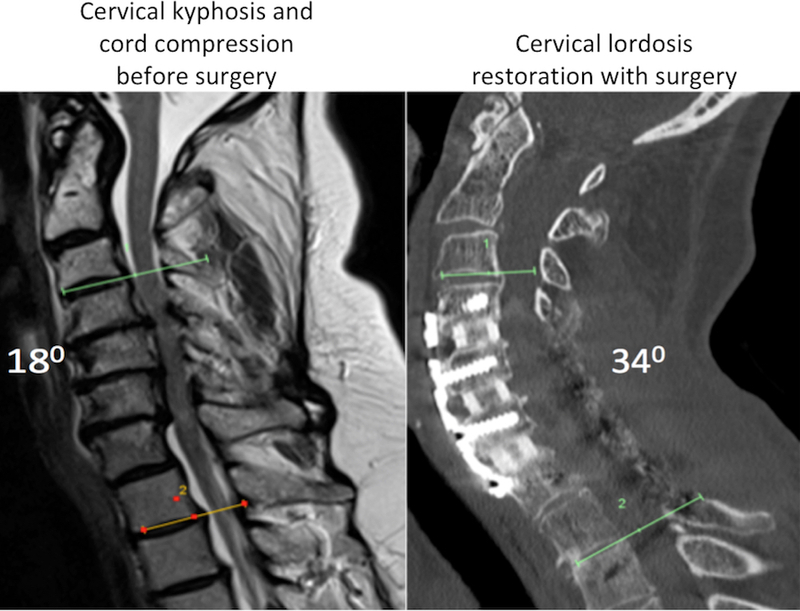 Performing the procedure only from the back can fully decompress the spinal cord, but unlikely to restore the lordosis. Combining a front and back approach may provided the best result. If you have questions about revision spine surgery or a complex spine condition, contact our BOARD CERTIFIED spine surgeon at RMBSI.